This is the 7th novel in the Maeve Kerrigan series, but only the second one I have read. I have to say that I am really enjoying this series. The characters are very well rounded and realistic, and the procedural aspect of the mystery is detailed enough to make me feel as though I’m right there in the thick of things. When 18 year old Chloe Emery leaves her father’s house earlier than planned to return home to her mother’s house, she’s greeted with what appears to be the scene of a homicide, but no body. As Maeve and her team dig into the matter, they find more and more suspects, and more people guilty of something, whether to not it be murder, than they know what to do with. The story is suspenseful, deliberately paced, and full of twists. 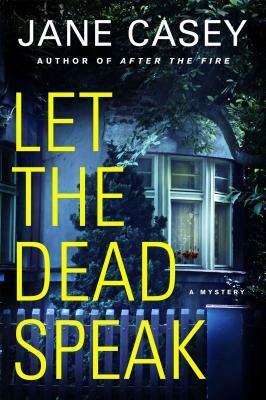 Let the Dead Speak is a must-read for mystery lovers. Sound good? You might also be interested in my review of book #6 in the series, After the Fire. NOTE: Thanks to Netgalley and the publisher for the chance to read and review an advanced copy of the book. All thoughts and opinions expressed are my own. I need to get back to these books. I read a couple of the early ones, then ….. Good review. I need to go back to the beginning…I enjoyed 6 and 7, but they do mention things that happened in the past that I would like to read about!